Nike+ involves the placement of a sensor underneath the footbed of your Nike running shoe in order to collect data about where you've run, how long it took and where you can improve over time - since each individual run becomes part of a collective historical database. Even though Nike+ website already gives individual users a variety of features to make sense of their personal data, the collective analysis of this growing database is remarkably promising. 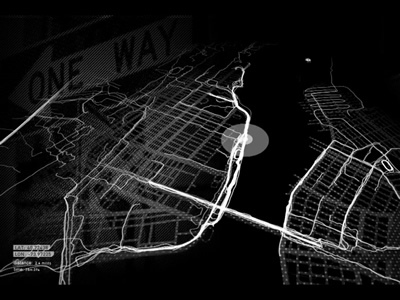 The interactive collective YesYesNo developed an installation for Nike's retail stores to visualize a year's worth of runs uploaded to the Nike+ website. With custom software, the installation plays back runs throughout three cities: New York, London and Tokyo. The runs showed tens of thousands of peoples' runs animating the city and bringing it to life. 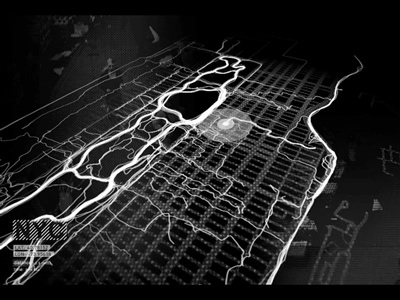 The software visualizes and follows individual runs, as well as showing the collective energy of all the runners, defining the city by the constantly changing paths of the people running in it.